SpiderOak ONE is an ideal option for those looking for high security and who want to sync across multiple devices. Users who need a solution primarily for mobile use may want to look elsewhere. SpiderOak offers a suite of services for both individuals and businesses, including cloud backup, file sharing, and messaging. Its backup service geared toward individuals is SpiderOak ONE. In this review, we’ll reveal everything you need to know about SpiderOak ONE so you can decide if it’s the ideal service for your needs. Overall, this service is a little less friendly towards mobile users than other backup softwares out there. However, it could be an excellent option for individuals or even small teams who are primarily looking for secure backup for desktop devices. Upon visiting the SpiderOak website, you’ll see the company has a few options when it comes to backup services (keep reading for a details of a reader discount). SpiderOak Groups is designed for small businesses, whereas larger companies can use SpiderOak Enterprise. However, for the purposes of this review, we will be testing out SpiderOak ONE, which is most suitable for individuals and small teams. The pricing for this service is straightforward and you simply pay for more storage. No matter how much storage you buy, you can always use the application on an unlimited number of devices. Apps are available for Windows, MacOS, Linux, iOS, and Android. The most basic plan will give you 100GB for $5 per month, which will be enough for many users wanting to back up text documents, photos, and music. However, if you store a lot of videos or other large files, you’ll probably run out space quickly. You can more than double your space to 250GB for $9 per month or jump to 1TB for $12 per month. Finally, 5TB will cost you $25 per month. Note that there is a discount on each plan, albeit quite small, if you pay for a year upfront. READER DEAL: Get 15% off your subscription using this page and the code Comparitech15. Overall, this is fairly pricey compared to other some other backup services. Also, some providers offer a one-time licensing fee along with continued support, which may be a more desirable option for some customers. It really depends if SpiderOak offers enough of the perks that you’re looking for to justify you spending more and on a continued basis. As for payment, for this particular service you can pay by debit card or credit card. Other SpiderOak services, such as SpiderOak Groups and SpiderOak Enterprise, allow other payment options on a case-by-case basis. If you want to try SpiderOak ONE risk-free, there is a trial version available for 21 days. You get a decent 250GB of space and no credit card details are required, which is nice. When you’re ready to purchase, you can either select Buy More Space within the client or log into your account online. Once you sign up for the service and provide payment information, the service will be auto-renewed and your card will continue to be charged until you cancel. There are mixed feelings about auto-renewal. Some like that they don’t have to worry about a service interruption while others would prefer to be required to authenticate every transaction. Nevertheless, SpiderOak makes it easy to cancel at any time from your account dashboard. Once you reach your storage limit, your account will simply stop uploading. This means you’ll never have to worry about overage fees. You can decide if you want to delete older items or buy more space to continue backing up new files. When it comes to perks, this service does have quite a few. Aside from being able to use it with an unlimited number of devices, you can also easily sync folders across all your devices so that their content is the same no matter where you’re accessing from. Aside from accessing your files on any of your own devices, you can also get to them through the web, wherever you have an internet connection. The one major downside here is that you can only upload from the desktop apps. This might be frustrating to some users, especially those who use their phone as their primary camera (which applies to a lot of us these days). SpiderOak makes it easy to share files with others via a couple of options. First, you can generate a URL for a specific file and send it to recipients. As a security precaution, these links expire after three days, so this method is handy in situations where you know the recipient will be accessing the file immediately. The other option is to use a ‘Shareroom.’ You can add any backed up folders to a room and invite others to access it. SpiderOak gives you lots of customizations options, including exactly when your backups occur and how your files are synced. For example, backups take place continuously by default, but you can easily tailor the schedule to suit your needs within the client settings. You can backup files from the SpiderOak interface or you can go to the actual file on your computer, right-click, and select SpiderOak ONE>Add to backup. The latter method is simply convenient, especially if you’re creating a new folder, as you don’t have to bother launching the client and locating it there. After a file has been backed up once, SpiderOak performs subsequent backups incrementally. This means it only backs up the modified part of the file instead of the whole thing. This saves time and bandwidth and is ideal if you have a slow internet connection. To save more space, you can also manually delete previous versions of each modified file. Bear in mind that deleted items go into a Deleted Items bin, from which they can be restored at any time. They no longer get backed up but they still take up storage. So if you want to free up more space, you’ll have to go into the bin and delete them again, after which they’ll no longer be accessible. It’s worth noting here that SpiderOak is designed for backing up select files and folders and is not suitable for creating an image-based backup of your machine. For this capability, you’ll need to look elsewhere. One of the major selling points of SpiderOak, which we’ll go into more detail about a bit later, is the high level of security it offers. It claims its ‘No Knowledge’ principle is more secure than end-to-end encryption, since “nothing leaves your computer until after it is encrypted and is never decrypted until it is unlocked with your password on your computer.” Indeed, this is a big draw for privacy-conscious users. However, we should also mention that SpiderOak is very explicit about the fact that the No Knowledge principle only extends to its desktop clients and will not apply to the mobile apps or web access of files. This, along with the lack of upload capability and the so-so design of the mobile app, proves that this service is built with a strong focus on desktop users. Of course, you’re probably wondering how SpiderOak performs when it comes to actually doing its job of backing up files. We tested the upload speed using a folder containing 210MB of mixed file types. This took just under five minutes to upload using a 30Mbps internet connection. This isn’t terribly fast but it’s also not considered slow, so as long as you don’t have massive amounts of data to upload in a hurry, then it should be sufficient. We typically test full system backups, but as mentioned SpiderOak is not suitable for this purpose. If you need to perform a backup on your entire system, you might want to consider another provider entirely or utilize one alongside SpiderOak. SpiderOak prides itself on having created a service that offers the utmost privacy to its users. Its No Knowledge principle ensures that everything is encrypted, beyond end-to-end. Data is encrypted before it leaves your computer and it is only decrypted when you unlock it with your password on your computer. This means that the company itself has no way of knowing what data you are storing on its servers. SpiderOak has its own physical servers located in the Midwestern United States. It uses 256-bit AES encryption, which is considered as good as it gets in terms of in-transit protection. The data is then decrypted using your password, which is hashed with more than 16,000 rounds and salted with 32 bytes of random data. Traffic is encrypted over TSL/SSL and HTTP Public Key Pinning is used to prevent man-in-the-middle attacks. Bear in mind that because of the No Knowledge policy, you need to be super vigilant about not losing or forgetting your password. If you do end up forgetting it, and are unable to remember it with the password hint (if you’ve set one up), SpiderOak has no way to retrieve or reset it. The only thing you can do is set up a new account, in which case SpiderOak will transfer the billing history from your old account to the new one. While this is excellent from a security standpoint, it could be frustrating. As such, if you’re prone to forgetting passwords, you’d be wise to use a password manager. In fact, you might want to check out SpiderOak’s offering, Encryptr. During our testing, we used SpiderOak’s Windows and iOS apps. Overall, the desktop client is visually appealing and well-organized. Once you’ve installed and logged into the application, you’ll arrive at the Home tab of the main screen. 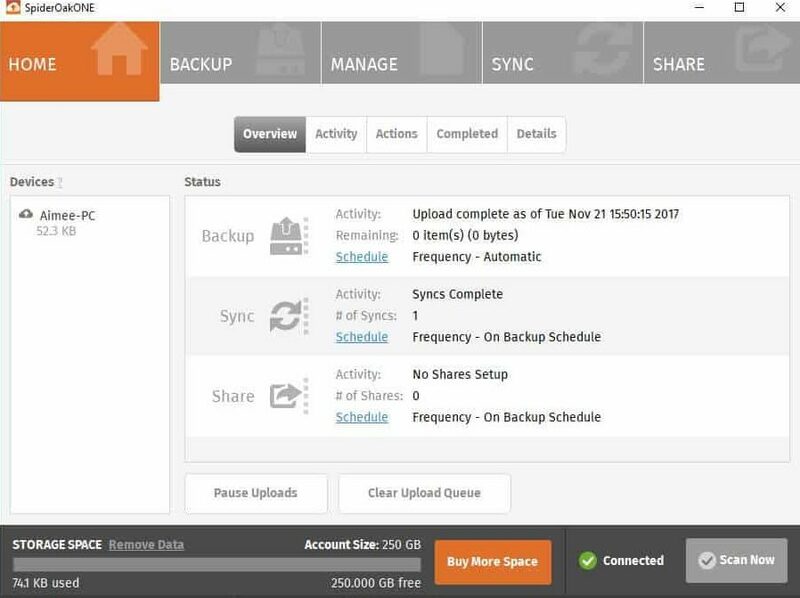 Here you can see an overview of your backups, syncs, and shares. You can use the white tabs (Activity, Actions, etc.) to see what’s currently happening or has recently occurred within your account. The left sidebar shows you which devices are connected. To add a device, you simply download and install SpiderOak ONE on that device and log into your account. It will then show up in this bar. At the bottom of the screen, you can see how much storage space you’re using and compare it to the limit on your account. The Scan Now button at the bottom right-hand corner will perform an immediate scan to see if any files need to be backed up. Below that, you have a Preferences link which is where you can adjust various settings. These include startup preferences, backup options (such as file size limits), scheduling for all activities, and network options. At the top of the main screen are multiple orange tabs. The Backup tab will show you all of the files that reside on the device you’re using. Here, you can easily select specific files and folders for backup. The Manage tab shows you which folders are backed up and stored. You can download files and create URLs for sharing. You can also delete files from this screen as well as access your Deleted Items bin. On to the Sync tab, you manage which folders are synced across devices. When you place a folder here, any changes that are made to it will also be made to the same folder in other locations. The SpiderOak installation automatically creates a sync folder called SpiderOak Hive. Anything you drop into this folder will sync across devices. However, you can also add other folders to the sync list. Finally, the Share tab allows you to create a ShareRoom. You add a name and description of your choice before adding any folders from your backup list. Then, a link will be generated which you can send to others so they can access those folders. You have the option to password-protect each individual room you create. With this intuitive and robust desktop, we were hopeful for a solid mobile app. Unfortunately, the iOS app we tested out didn’t exactly meet expectations. Upon install, the app asks for your credentials. 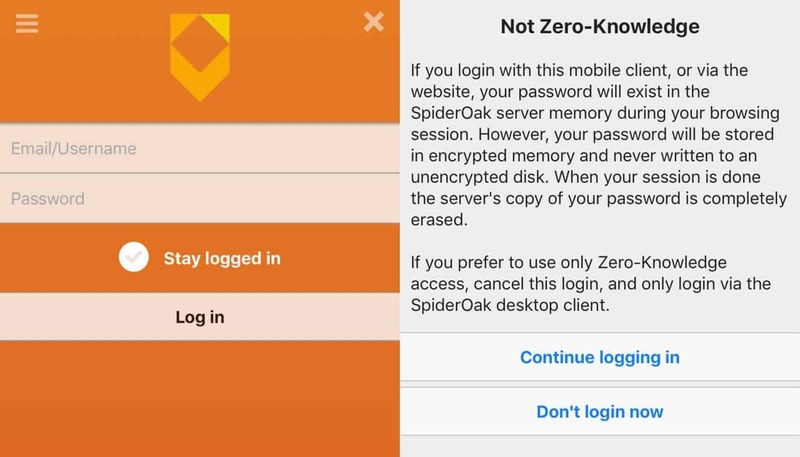 Once you hit Log In, you’ll be met with a disclaimer that explains that the No Knowledge (or ‘Zero-Knowledge’ as it’s referred to here) principle doesn’t apply to the mobile app, as your password will be temporarily stored on SpiderOak’s server. This doesn’t make it less secure that most other services. It just means the added layer of security you get with the desktop versions is temporarily lost. The fact that SpiderOak is very explicit about this should serve as a testament to the emphasis they place on user privacy. Once you’re in, you’ll see a very plain interface with a Getting Started PDF. You can hit the menu icon to view an equally plain menu with a few tabs. Under Devices, you can access files than have been uploaded through the desktop client. You can also visit ShareRooms and view favorite or recent files. Finally, under Settings, you have a couple of options for the app, including whether to stay logged into the app and to create a passcode. Even though it’s limited, the mobile app serves its purposes of offering easy access to files that have been uploaded to your SpiderOak account. This means you can view and share your files while on the go, and also access ShareRooms created by others. If this is your first time using a backup service, chances are you’re going to need a little help at some point. With SpiderOak, you have a couple of options. You can go into Help Center at the footer of the website. Here, you’ll find a list of SpiderOak’s products. Choose the ONE backup tab where you’ll find a huge repository of articles. These cover an array of topics, including getting started, how-tos for using the software, and some techniques for advanced users. If you can’t find what you’re looking for here, you can hit the Submit a request link in the top righthand corner of the page. Here, you’ll find a form to fill out with details of your concern. You can also find the same form by selecting Contact Support in the footer of the main site. We sent a request and it was responded to within two hours, which is pretty decent. The response was extremely polite, knowledgable, and thorough. SpiderOak is also very active on social media. There’s lots of daily activity on its Twitter account and Facebook messages are typically responded to within one day. SpiderOak does not offer a live chat option. However, this typically means outsourcing to companies like LiveChat or Zendesk, raising privacy concerns. Given SpiderOak’s intense focus on security, it’s not surprising that they’ve opted to keep everything in-house. SpiderOak ONE is ideal for users who are looking for an online backup solution that also offers cloud storage. Its sync and sharing capabilities mean it is very useful for those with multiple devices and even for small teams. Plus, its ease of use and solid customer service makes it a great option for beginners. What’s more, the focus on security is certainly something that will attract those looking for maximum privacy. SpiderOak hopes that these factors are enough to convince you to fork over a little extra cash, as its price point is a little above average compared to other backup services. The main letdown from this provider is the absence of features catering to mobile users. Aside from having an uninspired overall design, the app lacks the functionality to upload from your mobile device. This is especially unhelpful for users looking to back up images from their phone’s camera. Furthermore, using the service on a mobile device will void the No Knowledge principle, one of the things that makes the service so attractive in the first place. If you’re looking for a secure and reliable backup service for desktop use, and you think you’ll use the added perks of sync and sharing, then it’s a great choice. But if you need something that has an equally robust mobile offering, then you may want to looks elsewhere.